Real Estate regulator Authority of uttar pradesh (UP-RERA) has now published the official recruitment Notification for inviting online application form for 23 Post of for 14 different cadre of Uttar pradesh. All eligible candidates who want fill application form for Up Bhu sampada Viniyamak Pradhikaran, they can fill application form in prescribed application form format. 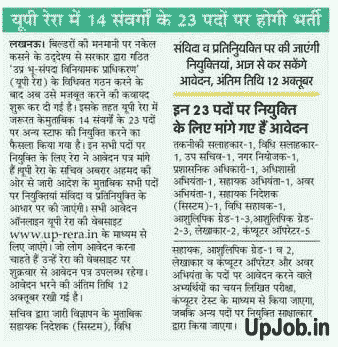 See details of recruitment, date of application and examination pattern at these posts in UP Rara. Due to the formation of the “Real Estate (Regulation and Development) Act, 2016 " (UP RERA) constituted to tighten the builders' arbitrariness, now the exercise of strengthening it has begun. According to the requirement in UP RERA, it has been decided to make appointments to 23 posts of 14 cadres. RERA has asked for the application for all these positions. According to an order issued by UP RERA secretary Abrar Ahmed, appointments will be made on all posts on contractual basis and on deputation basis. All applications will be taken online through UP RERA's website 'www.up-rera.in'. The application will be available on this website from Friday. The last date for filing of application is kept October 12, 2018. Candidates applying for Assistant Director (System), Law Assistant, Ashu Clerk Grade-I and 2, Accountants and Computer Operators and Junior-Engineers will be selected through written examination and computer test according to the advertisement issued by the Secretary. Other posts will be appointed through interview. Download official Recruitment Notification , Eligibility Criteria, Age Limit, Education Qualification and other Important Details in PDF file.